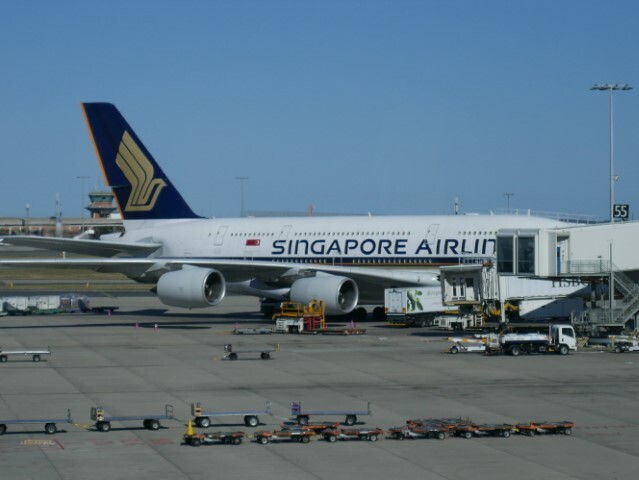 Singapore Airlines has 4 direct flights per day from Sydney to Singapore. 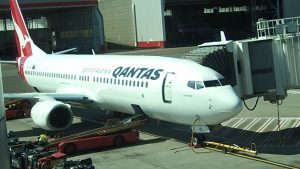 They have a lot more flights from Sydney that go via Canberra and Melbourne. SQ212 departs Sydney 7.55am and arrives into Singapore at 2.15pm. Plane used for SQ212 is the Boeing B777-300ER. SQ232 departs Sydney 11am and arrives into Singapore at 5.30pm. 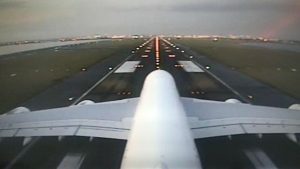 Plane used for SQ232 is the Airbus A380-800. SQ222 departs Sydney 3pm and arrives into Singapore at 9.20pm. Plane used for SQ222 is the Airbus A380-800. 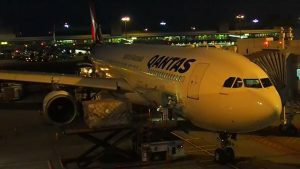 SQ242 departs Sydney 6.05pm and arrives into Singapore at 12.20am. Planed used for SQ242 is the Boeing B777-300ER. It has been more than 27 year since I have flown on a Singapore Airlines flight. As a loyal Qantas Frequent Flyer I was keen to try some different airlines. 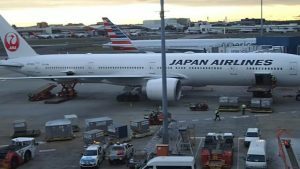 I booked in for 4 flights (this being the first) flying from Sydney to Singapore, Singapore to Tokyo Narita and then the same return route. Overall I was really impressed with Singapore Airlines. 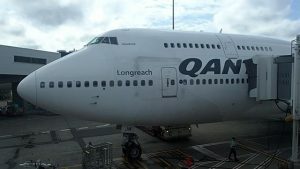 Really delightful crew, delicious food, awesome entertainment system and a service level much better than I have experienced on Qantas! I joined up to the Singapore Frequent Flyer program called KrisFlyer. 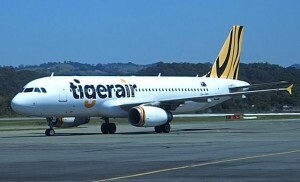 As a basic member, for this flight between Sydney and Singapore I earned 4890 KrisFlyer mile points. 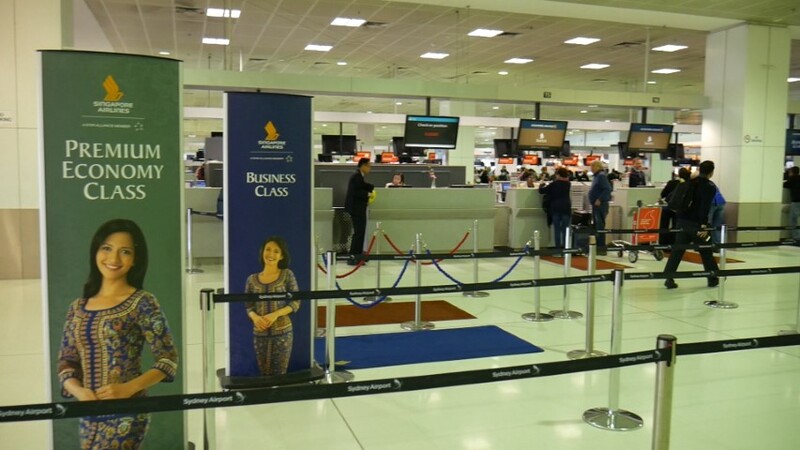 At Sydney Airport, the Singapore Airlines Check-in counters are located right at the far end in Row K (the very last row of check-in counters). If you are arriving by taxi, get them to drop you at the far end of arrivals. If you are arriving by train to Sydney airport, then you have a long walk to the far end of the check in counters. 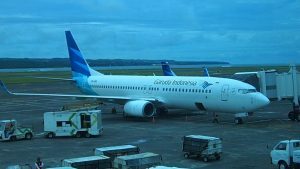 There are separate check-in counters for Economy, Premium Economy, Business and First Class. The service at the check-in counter was your typical ‘Sydney airport service’, no smile, no greeting, just took my ticket, punched on her keyboard, then handed me my boarding pass. Not the best first impression for Singapore Airlines but luckily the rest of the flight experience made up for this lacklustre service. 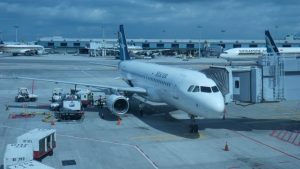 With the Business Class ticket, you are given an Express Pass to quickly pass through immigration and security checks which saves some time going through the long queues at peak times. Also with the Business Class ticket you have access to the Singapore Airlines SilverKris Lounge which is close to Gate 55 where this flight leaves from. 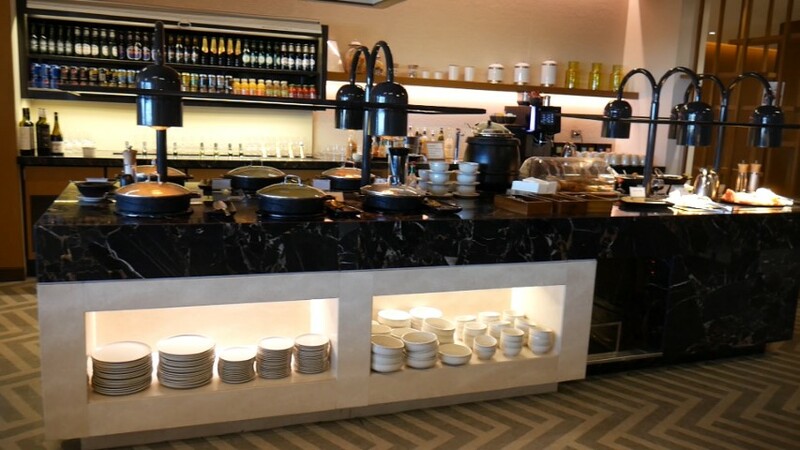 The Singapore Airlines SilverKris Lounge is a very nice lounge area with a great selection of food to choose from. 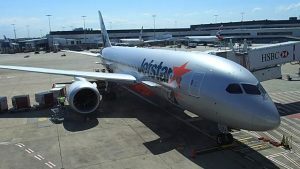 The view from the KrisFlyer Lounge gets a close up view of some of the other StarAlliance aircraft like Air New Zealand. 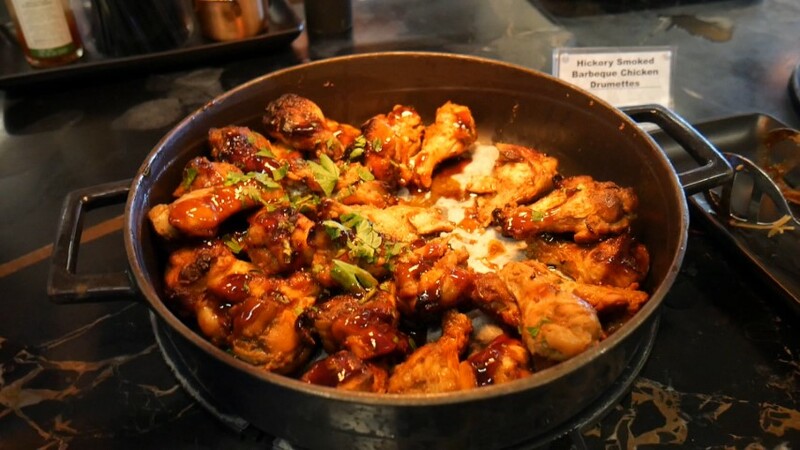 The small buffet has a great selection of mostly Asian food, salads, fresh breads and a fully stocked bar. The highlight of the beer cabinet is the famous Singapore Tiger Beer. For the food, the highlight was the delicious Hickory Smoked Barbecue chicken drumettes. They do have free Wifi Internet access in the lounge. 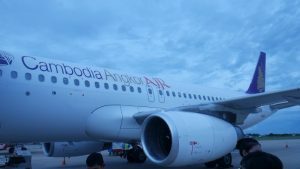 With priority boarding for Business Class passengers, it did not take long to get on the plane and to my seat. 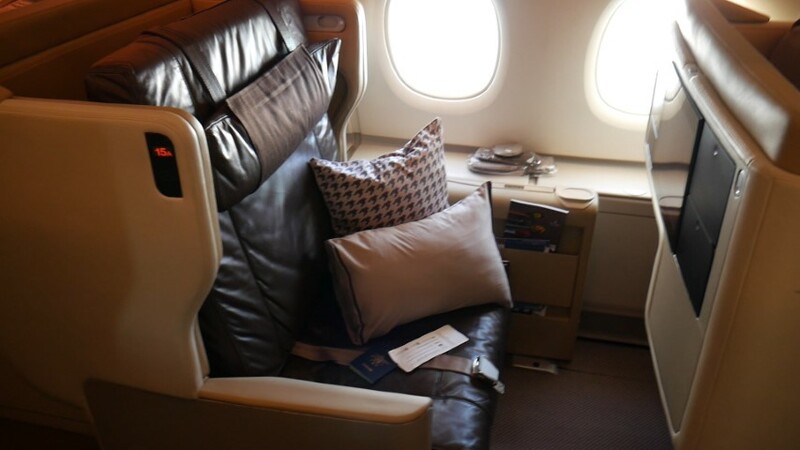 Now this is where the great Singapore Airlines service shines. I wasn’t just greeted at the door, but one of the cabin crew greets you and walks you to your seat. This is a great touch of excellent service. 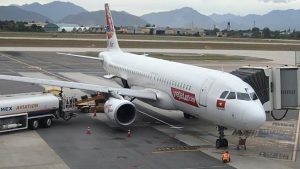 No need to stumble down the aisle way, lugging your carry-on bag and duty free shopping, looking at your ticket and then looking up to find your seat number. 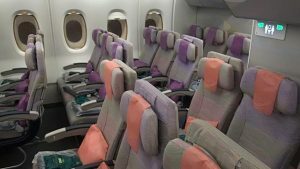 This is the widest Business Class seat you will find on any aircraft. At 30 inches, if I didn’t have such a big caboose, I could have almost fit a second person into my seat. The seat reclines back to about a 130 degree position. Then to lay it down to the 180 degree fully lay flat bed, you need to get up and pull a latch on the seat and pull the whole back section forward. Now the 130 degree recline, was just not enough for me to lay back comfortably to relax and watch a movie. 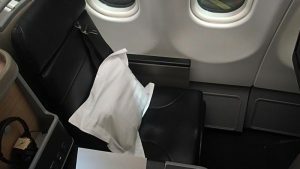 Sure this is a First World problem, but I am used to the Qantas Business Class seats which you can recline back to any degree you want. 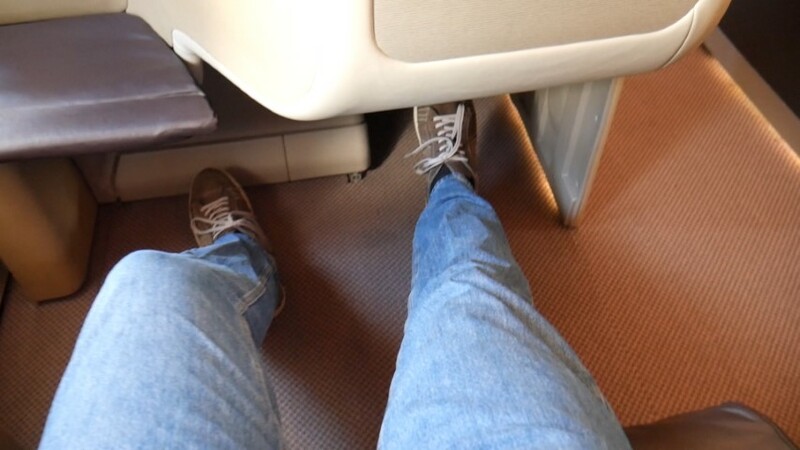 There is some great legroom for you to stretch your legs straight out in front of you or there is a ledge where the layflat bed stretches out to where you can also stretch your legs out horizontally. There is a Universal Power plug if you want to plug in your laptop or any other electric device. 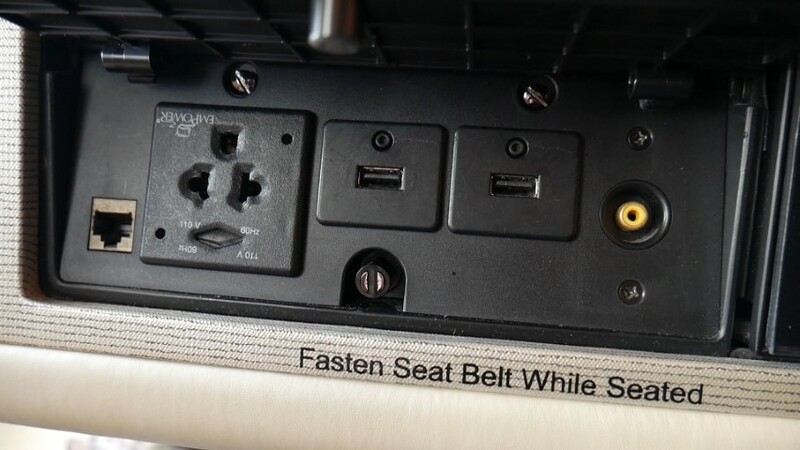 There is also 2 USB ports for charging your devices. There is also an RCA port and an ethernet RJ45 port which I can not work out what these would be used for. Post a comment below if you know what you do with these ports. There are also plenty of storage compartments where you can store your passport, mobile phone and any other small items. 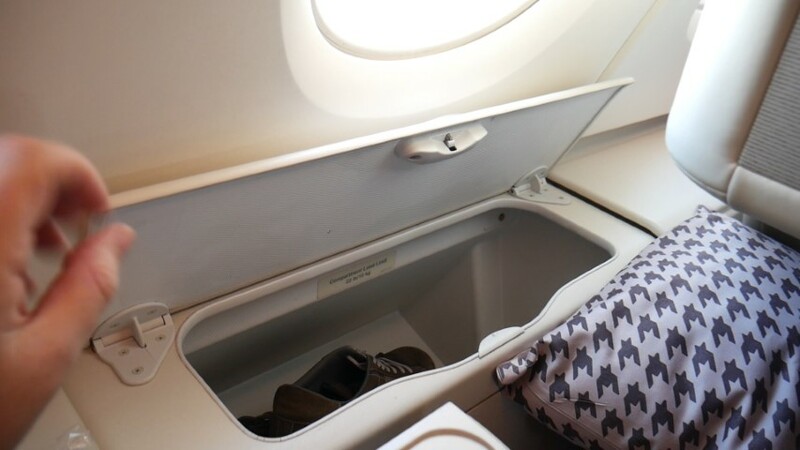 Also between the seat and the window there are 2 large storage bins where you can store your shoes or any small bags. The entertainment screen was an older style screen which was not touch screen. There was a control unit built into the seat. The screen was still a nice sized 18″ screen and the system was loaded with heaps of latest release movies, TV shows and music CDs. I managed to get to watch 2 movies during this flight. 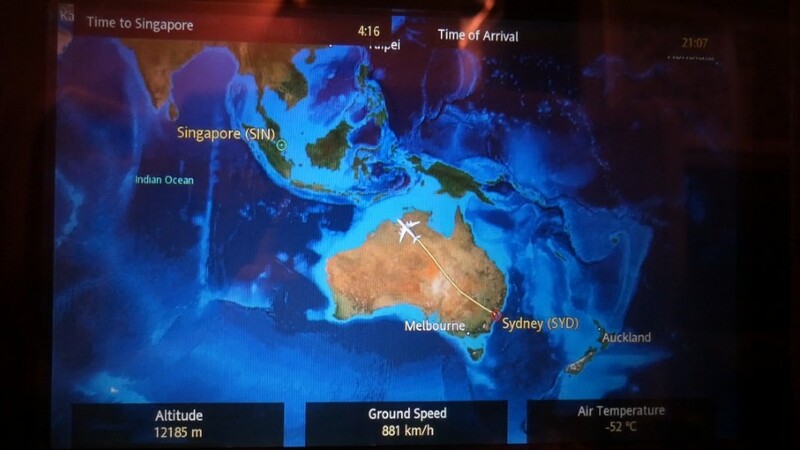 On of the highlights of the Singapore Airlines Entertainment System is the Inflight Map which shows you the route you are flying and your current position on that route. There is also a copy of the SilverKris Inflight magazine in the seat pocket. I did find that I kept having to register with an email address. I think you get 30 minutes of use and then you have to register again. 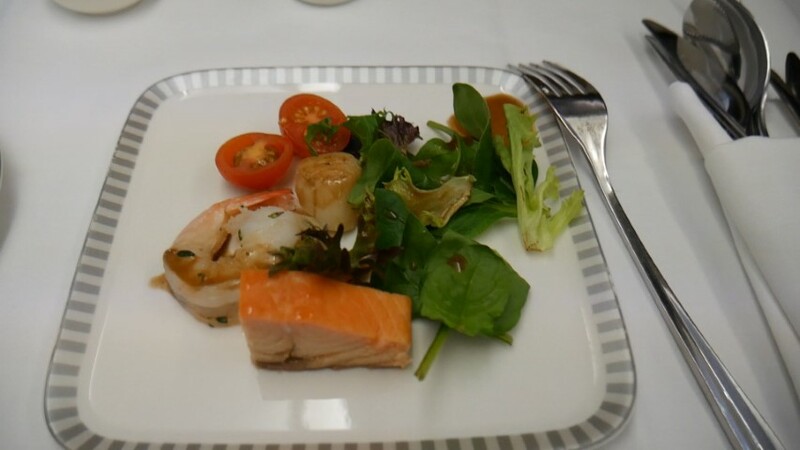 The food is one of the high points of flying with Singapore Airlines. On this SQ222 flight they serve 2 meals. 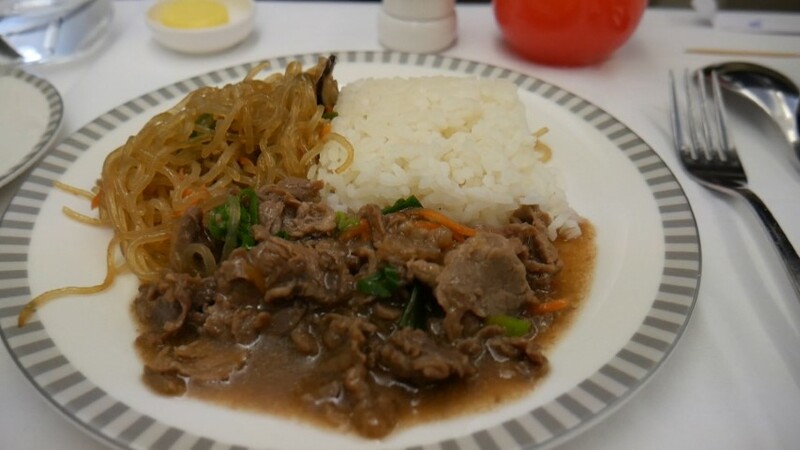 A dinner service straight after take-off and then a refreshment meal about 1.5 hours before landing. 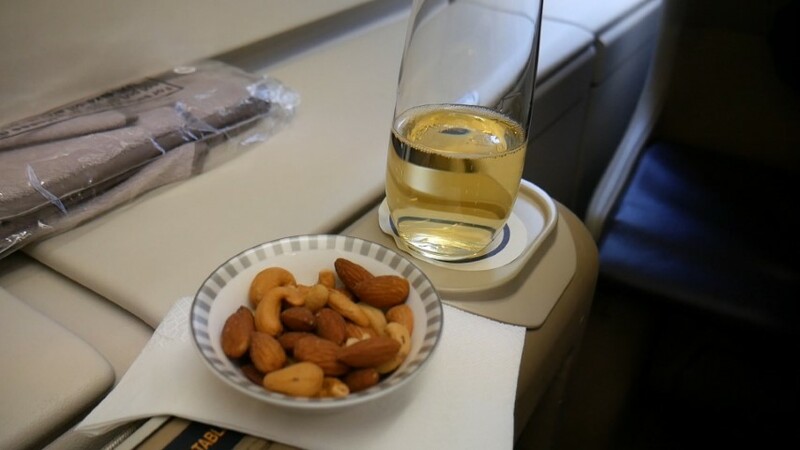 Before take-off they bring around a choice of Champagne, fruit juice or water. The Champagne served is the Charles Heidsieck Brut Reserve from Champagne France. Before taking off they come around and ask you what you would like to drink after take-off, and it is not long after take-off that they bring this drink with a small bowl of nuts. The Business Class food menu is found in the seat pocket and lists out the choices. The meal starts with an appetizer of a Seafood Salad which came with marinated scallop, prawn and smoked salmon. A very tasty salad! Braised Morocan lamb with leek, asparagus, carrot and mashed potato. Barramundi fillet in Oriental XO sauce with pak choi and egg noodles. Seared Chicken in Tarragon Jus with roasted vegetables and sauteed baby spinach in olive oil. Beef Bulgogi with Japchae and Steamed rice. I went for the Beef Bulgogi which was delicious. This was a bit carb heavy with both the Japchae noodles and steamed rice. I just finished off the beef and Japchae noodles and left the steamed rice. With the main meal I tried one of their delicious Singapore Sling Cocktails which is made from a concoction of dry gin, Dom Benedictine, orange liqueur, cherry brandy, shaken with lime and pineapple juice, a dash of Angostura bitters and Grenadine. This is a must have when you are visiting Singapore or if you are flying on Singapore Airlines. The Singapore Sling was invented in 1915 and the best place to have this in Singapore is at The Long Bar at Raffles Hotel. I chose the Raspberry Bavarois cake which was the dish of the meal. 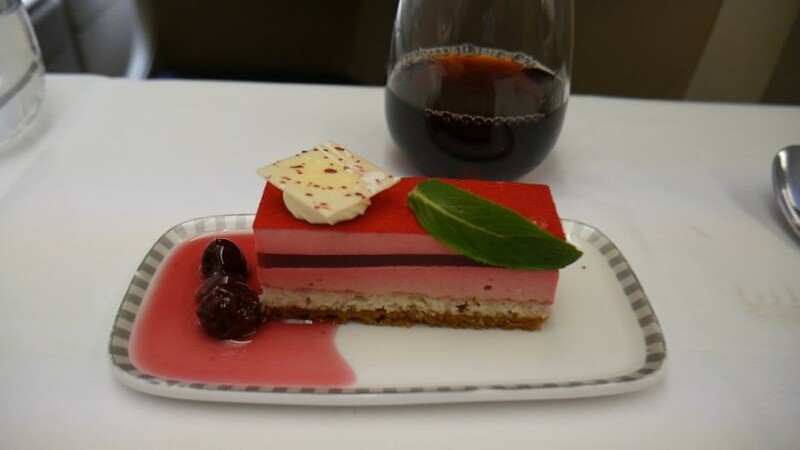 In all my years of flying, I usually find the dessert onboard planes as the most delicious dish served in the meal. With the dessert I enjoyed a glass of the Dow’s 10-Year-Old Tawny Port from Duoro Portual. There was also a selection of cheeses and they also brought a cart through with a choice of fresh fruit. Awesome food Singapore Airlines! This was an excellent meal. Very hard to fault any of this food on Singapore Airlines. It is no wonder why Singapore Airlines gets into the Top 10 Best Airlines of the world each year. I cannot fault the service on board this flight. 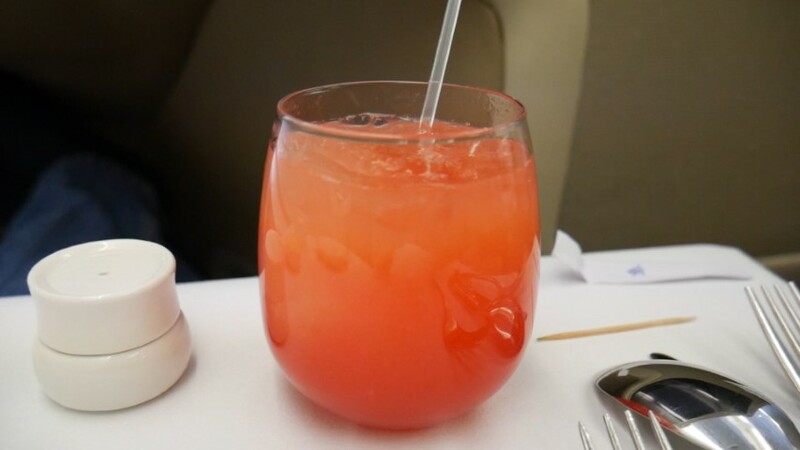 From the little things like being taken to your seat, drinks being served straight after take-off and the food a very close follower. The crew on board Singapore Airlines seem to effortlessly do their jobs and they work with a smile and show real respect to the customers. 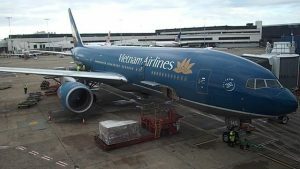 I do believe Singapore Airlines provide the most intense training for any airline and it truly shows with the level of detail the crew provide. 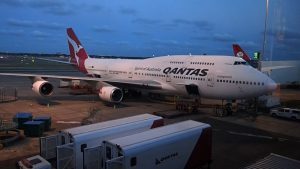 With the level of service, the awesome food, the great A380 Business Class seats, I will definitely be reconsidering which airline I choose next time I fly between Sydney and Singapore! Great work Singapore Airlines. 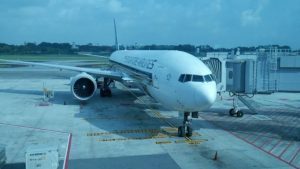 I loved this flight and look forward to flying Singapore Airlines soon. You can book flights directly on Singapore Airlines website.